We’ll see lots of rain showers this week, October 1-5, then the weather pattern will become colder and we will likely see a bit of snow on October 5-6 and a better chance for potentially significant snow between October 6-10. The perfectly sunny and dry days of September are now behind us and the weather pattern will become more active for at least the next two weeks. On Monday, expect a cloudier day, though we’ll likely stay mostly dry. Then on Tuesday and Wednesday, moisture from the remnants of Hurricane Rosa will bring showers. Not every mountain area will receive significant rain, though some spots will receive 1-2+ inches of rain, which is significant. During the end of the week, on Thursday and Friday, the showers will continue. 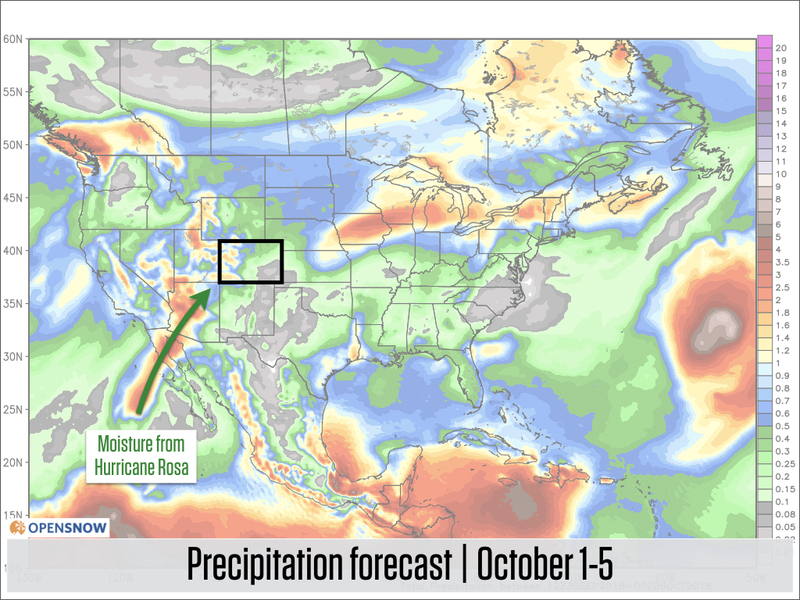 Total precipitation for this week (Monday, October 1 through Friday, October 5) could be significant over the mountains. While we could see a lot of precipitation this week (image above), we will NOT see a lot of snow. 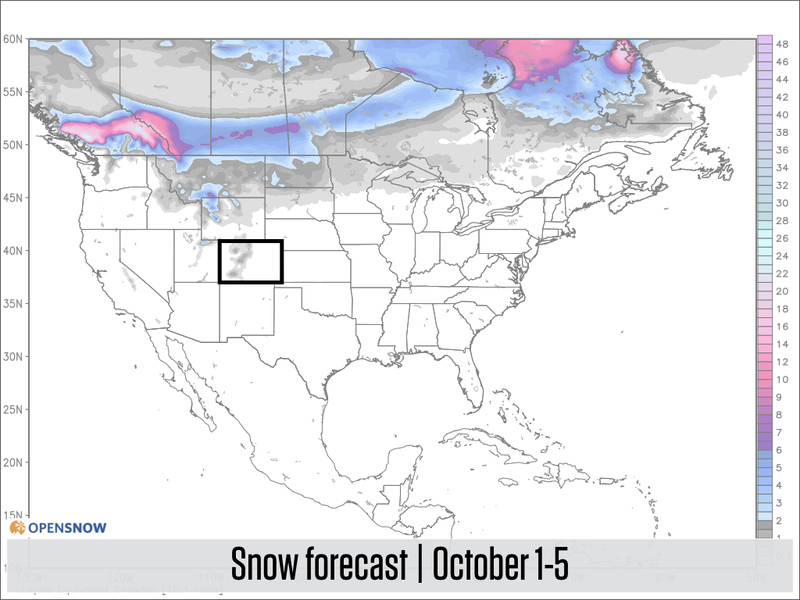 The snow forecast for the week shows just light amounts over Colorado. This is because temperatures will be very warm until about Friday, so most of the week’s precipitation will fall as rain with only the highest peaks seeing snowflakes. If you want to see snowflakes at ski-area elevations, keep your eye on the time between Friday and Saturday when cooler air will finally arrive. Recap for this week – a good chance for significant rain Tuesday, Wednesday, and Thursday, then Friday and Saturday will bring cooler temperatures and perhaps a bit of snow. 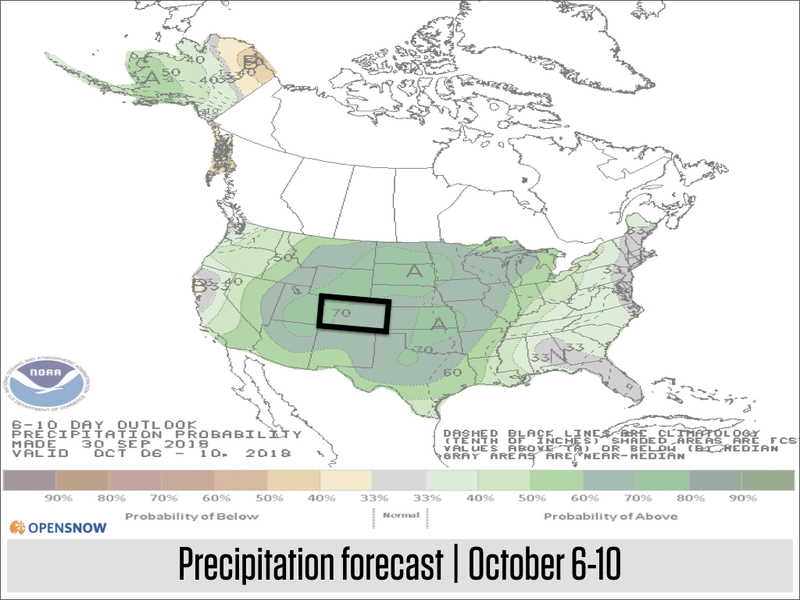 NOAA’s forecast (which is the average of many models) shows a good chance for above average precipitation. 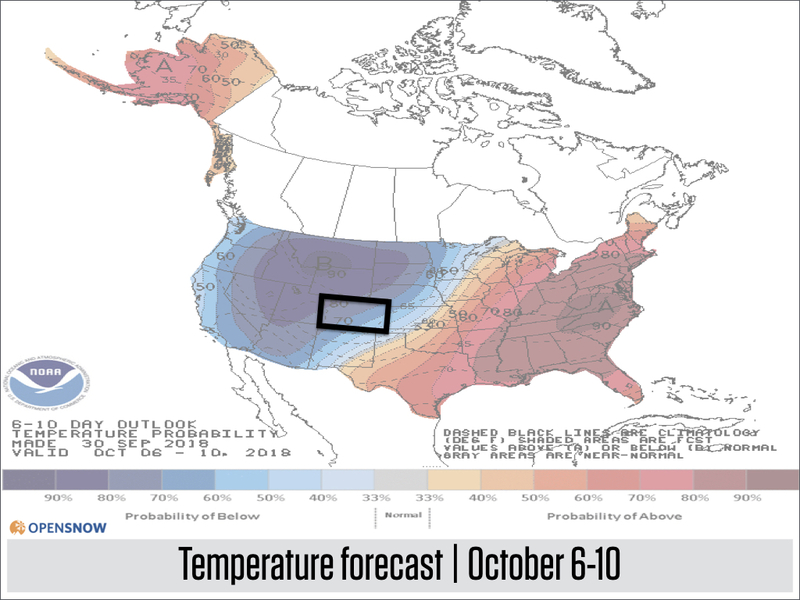 And, the most important part, is that NOAA’s forecast also shows a good chance for colder-than-average temperatures. The combination of above average precipitation and colder-than-average temperatures in October in Colorado is a recipe for snow, so my eye is on the time between October 6-10 as a likely period that our mountains could see the first significant snowfall of the season. Let’s look in detail at Crested Butte, which I choose because it’s roughly in the middle of Colorado’s mountains. With the storm still 6+ days away and the forecast likely to change, we should look at generalities rather than focus on a particular corner of the state. In the graphic below, each horizontal line shows the snow forecast from one of the 51 versions of the European model. I highlighted in red the period from October 6-10. What’s awesome is that nearly every model version (each horizontal line) shows at least some snow, and about 50% of the model versions show significant snow. 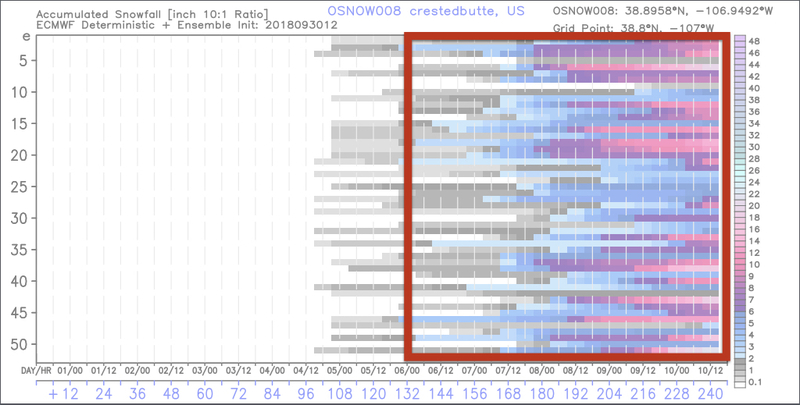 This is plenty of evidence for me to say that either this weekend or next week will likely be the time when at least some of Colorado’s mountains get their first significant snowfall. Of course, the details of this forecast will change daily between now and then, so let’s not get too excited for a specific amount of snow at a single location. Rather, the takeaway is that this week will be rainy, and then the upcoming weekend and next week will be much cooler with snow likely.